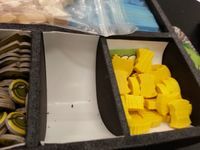 Walsfeo's Box Inserts & Storage Solutions. 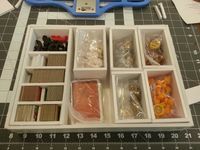 I'll show images both for the box inserts I create, but also how I store bits for games. 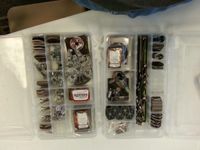 This not only means stuff I create out of foam board but also Plano boxes for games like X-Wing or teams for Blood Bowl. I usually use a colored pencil (white or gray) to mark up the boards and an X-acto knife for cutting. Currently I use the back of a poly-cutting board I have for other crafting purposes but I hope to get a self-healing cutting mat. The most useful tool I have found for this is my t-square. If you can't get a good t-square, then a metal ruler with some sort of non-slip back is a good second option. 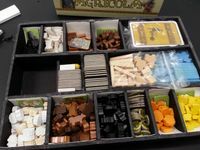 Other people doing a better job at this than I.
Re-purposed Caverna insert modified to be used for Agricola. As you can see by these first images I made my resources tray a little taller than it should have been, if allowing the box to close all the way was important. It wasn't all that important to me. I cut the foam out between some of the board at the end so I could fold them back to act as stabilizing tabs. The theory was this would enhance structural stability. I also replaced some of the components in the game. The generic first player pawn had to be replaced by an actual adventuring dwarf, and the chipboard food counters needed to be replaced as well. I went with little bowls I found at the craft store. Apparently they are supposed to be the end cap on a dowel rod or something. I added animeeples I'd purchased from Tanga years back when I thought I was interested in Agricola. 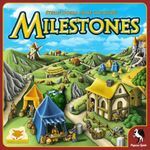 Well, I wasn't interested in Agricola, so they've been wandering around the house looking for something to do, so I added the cows, sheep and pigs to Caverna, but they look a little different. I think it's cool. Now that it's done I wish I'd created a small tray for each race, so a player could pick it up and be ready to play. The problem with that is that there are not enough conflict decks so each race can have one, and not enough of the resource tokens. Vehicles for all the races - just some shallow wells inside of a deeper frame. I glued some cardboard tubes onto a board. The towers slide over the tubes and are kept in place. The tubes were from rolls of stickers, and didn't need to be modified at all. All of the bits in the box, with the extra tiles along the edge in case I come up with an optional rule/expansion using them. 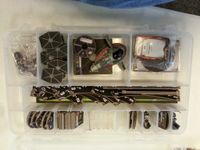 The two removable elements, money tray and tile tray, out of the box. Close up of money tray. 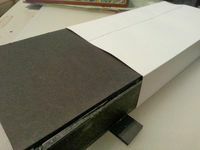 When tray is in box, there are additional slats to keep money in place to prevent shifting. In box, you can see it fills everything up nicely. 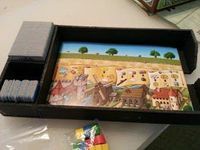 This shows the token tray in it's sleeve, and the tray for the tiles and player boards. Sadly, there are still some plastic bags included in the box. 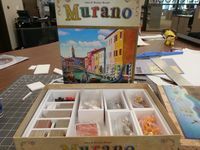 Another view of the tiles and player boards tray. It can be removed from the box, but will probably not be taken out for game play. Close up of tile bin. 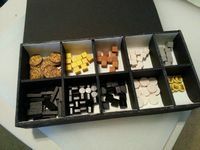 Sleeve for the tokens and cubes tray. It could have been tighter, but I think it'll work most excellently. Token tray without sleeve, but with lid. 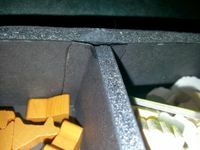 Open token tray, showing the insert made from the white chip-board originally included in the Milestones box for two purposes. Not only does the curved corner make it easier to get the bits out, but the white color helps see the remaining stock. Yeah, that's an issue when three of the bits are black and I'm using black foam board. 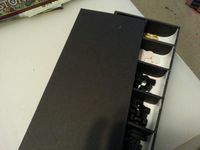 With my inserts this is a very full box. 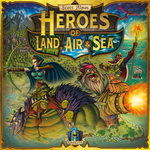 Each player has one bin, which includes their forces, and their starting location tile. These were actually for use in my Descent game, but when I realized how well they worked here, I just bought plastic bins for Descent. When putting them back away it helps to do it in the right order. Edit to add: I actually made this insert a couple years ago, it just never occurred to me to post these before. 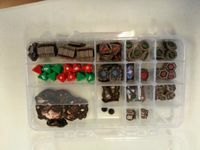 I use a separate box for the tokens, one I keep by the table instead of busting all the tokens out. My Rebellion ships. 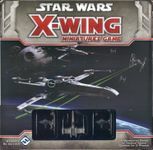 I like the variety of the rebellion, but really I'd like to run a full squadron of Y-Wings or A-Wings. 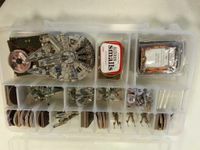 My storage for the Empire. Since then I've added the Tie Interceptor. I wasn't really planning on doing a Steam insert. I've never even played the game, but when I was clearing out games I decided I really wanted to give this one a try. 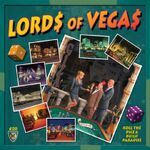 And the past few weeks of bad weather have prohibited me from playing the game so I decided to make an insert which would make it easier to actually play when we got together. 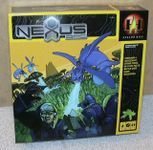 I actually made two inserts for this game, but the first one was a failure because getting the rail hexes out of it was very difficult. I didn't have the space to make the individual cells larger, so I used a mix of poster board (for space) and foam core for stability. The resulting insert is ugly, but I think it will be functional. Some of the bits coming out to reveal the storage structures. Little boxes cleverly inserted (or randomly crammed) inside my bigger insert.